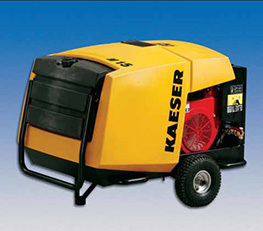 Kaeser's Mobilair Line Of Portable Air Compressors Are Designed & Built For Rugged Use & Dependable Performance. These Portable Air Compressors Provide A Reliable Source Of Compressed Air For Construction Sites & Other Industry Applications Such As Demolition, Post Driving, Carpentry, Sand Blasting, Sprinkler Irrigation & Monument Engraving. A Wide Range Of Tow Behind Air Compressor Models & Accessories Are Available To Suit Virtually Any Need. The Kaeser Model 15 Mobilair 15 HP Honda Gasoline Powered Air Compressors Are Equipped With A Folding Handle, Oversized Pneumatic Tires & A Compact Design Which Allows For Easy Movement Around Any Jobsite. The Kaeser Model 15 Air Compressor Features The Patented Kaeser Power Saving "Sigma Profile" Airend. The Efficient Kaeser Design Maintains Steady Pressue & Puts Out More Air Per Horsepower, Saving You Gas. Driving These Airends Are Quiet But Powerful Honda Gasoline Engines With Modulation Control Which Match Air Output To The Load Demand. The Kaeser Model 15 Mobilair 15 HP Honda Gasoline Powered Air Compressors Have A Simple Electric Starter & Keyed Ignition & Easy To Read Control Panel. The Scratch, Dent & Impact Resistant Rotomolded Polyethylene Shell Takes A Beating & Still Protects The Unit. Inside, The Compressors Are Protected By 4 Micron Inlet Filters Rated At 99.9% Efficiency, Allowing The Kaeser Model 15 Mobilair 15 HP Honda Gasoline Powered Air Compressors To Operate In Virtually Any Construction Environment. Single Stage, Oil Injected Rotary Screw Airend With Power-Saving Proprietary "Sigma Profile"
Dimension (L x W x H) 42-1/2 x 31-1/2 x 31"
Due To Weight Restrictions This Unit Must Ship By Common Carrier. This Is An Additional Charge To Sales Price Above. Please Call For Freight Quote Or Supply Preferred Carrier & Account Number In "Messages" On Order Form. This item cannot be shipped by UPS. It will ship by common carrier directly from the factory. For a quote on shipping cost to your location, call (303) 431-9929) or email coeqs@hotmail.com with the Zip Code to which you would like it shipped. Please specify if the delivery location is commercial or residential. Trucking companies charge more to deliver to residential locations. If other options such as “Liftgate” or “Call To Schedule Delivery” is required these may also be an additional charge. Price Above Does Not Include Packaging For International Shipments. Exporting Requires Crating At An Additional Charge.